Following in the footsteps of FedEx and USPS, UPS this week announced their own 2018 rate change. While UPS maintained the industry standard of a 4.9% year-over-year (YoY) increase, there are still a few facts merchants should know regarding how the UPS rate change could impact shipping costs. 1. The 4.9% increase is an average. As has been the case in the past, the 4.9% rate increase is an average across all weights and zones. The percentage increase for your shipping mix might be different, as the rate varies depending on weight. Lighter shipments will have a slightly higher rate increase than heavier shipments. Note: Percentages are approximations and used for illustrative purposes only. 2. Rate increases for UPS Air shipping will vary based on type of service. The cost of lower-priced parcel services (including 2nd Day Air A.M., 2nd Day Air, and 3 Day Select) will increase at a higher rate than the premium shipping options (Next Day Air Early, Next Day Air, and Next Day Air Saver). 3. The cost of value-added services can increase by more than 4.9%. Fees for additional pickup and delivery services may increase by a higher rate than transportation. For example, in 2018 the fee for UPS Address Correction will increase by 18.7% to $15.90. Note: The above list is not comprehensive; it only includes the services that had a YoY increase greater than 4.9%. 4. The fees for larger and heavier packages will increase significantly. Due to the rise in the number of shipments of oversized items such as TVs and appliances, parcel carriers (including UPS) have had to substantially adjust their shipping policies. This includes an increase in the Additional Handling Fee to $19.00 as well as an increase in the Large Package Surcharge to $90.00. The new fee and surcharge amounts will go into effect on July 8, 2018. FYI: The Additional Handling Fee applies to parcels with an actual weight greater than 70lbs, including packages shipped via UPS SurePost. The Large Package Surcharge applies to parcels with a length exceeding 96 inches and a girth greater than 130 inches. Additionally, the dimensional weight threshold of 139 inches will now affect packages under one cubic foot (1,728 cubic inches). 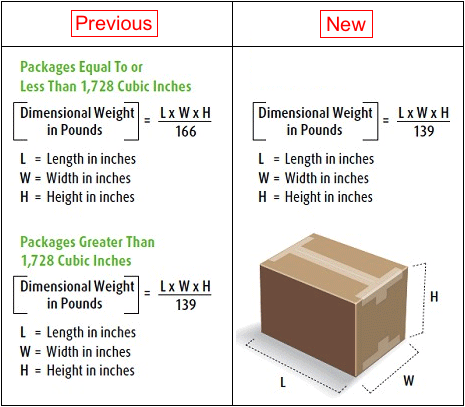 Previously, shipments under one cubic foot were subject to a 166 inch dimensional weight divisor, while shipments greater than 1,728 cubic inches utilized the 139 inches divisor. 5. The UPS rate change goes into effect on December 24, 2017. As a result, the price of a shipment prior to holiday shipping deadlines will differ from the price during the holiday returns season. Merchants must be prepared for this increased shipping cost and the affect it will have on their returns. Know your shipping characteristics. Identify exactly how each part of the UPS rate change affects your shipping so you can adjust your processes accordingly. Evaluate your packaging. Because of changes to dimensional weight and additional handling fees, now is the time to determine if your packaging is right for your shipments. Communicate with your carrier. Talk to your UPS representative to find the right services and packaging options. Planning early and collaborating with your carrier will pay dividends down the road. Take advantage of ShipStation’s Branded Returns Portal. It empowers merchants with additional control, visibility, and choice into the merchant-customer returns process.